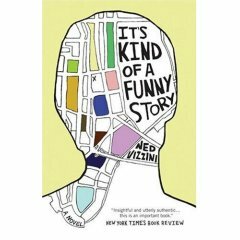 Hey, Ned Vizzini dropped by my library last night! For an author visit! And he has one of the best ways of presenting his novels of any YA author I’ve seen! To wit: he holds one in each hand, then shoves them in front of the audience like a pair of pistols. “Here are my books — BAM, son!” Apparently, this is the way to go when spending time talking to inner-city high school groups. It makes me want to create some sort of book-bandolier. Regarding Teen Angst? Naaah . . . “The world in which you can sell books of little vignettes doesn’t exist anymore because of blogs.” Huh. This made me feel guilty, even though I don’t write slice-‘o-life vignettes. Will he write any more YA? No — his current project is a novel for adults. He feels it’s a “little disingenuous to write about high school when I’m so far removed from it.” Huh. He should talk to Aidan Chambers. Where does he find the books he reads? Book Mooch. I had never heard of this, but now I see that it is awesome. Go. Go now. New books for old! Or rather, old books for old! Sweet. The last question of the session was from a teenage girl who asked what music Vizzini listens to. The question seemed to exasperate him, since he doesn’t keep up with contemporary music, but he says that one band he likes to listen to is a punk group called Wanted Dead. He says he bought their CD “from some guy wandering around the WARP Tour.” After looking them up myself, I have concluded that Wanted Dead is a band begging — nay, destined — to have a kitch-cult following.